Ripple's XRP has quickly risen to the second most valuable cryptocurrency, with a market cap of over $130 billion. XRP is much different than other cryptocurrencies as it is controlled by Ripple, a San Francisco-based corporation. Some cryptocurrency proponents have expressed doubts about XRP, stemming from Ripple's creation and control of the system. Ripple's XRP has quickly grown to the second-largest cryptocurrency by market cap. XRP is much different than many popular cryptocurrencies. Most of these differences stem from XRP's creation and ownership: XRP was created by a corporation, Ripple, to offer a service to financial institutions. Ripple still owns the majority of XRP, and is worth $200 billion, by some estimates. Its founders are richer than Google's founders, on paper. However, others have expressed belief that XRP is a bad investment and perhaps a money-raising scheme from a corporation. I have done my best to present their arguments and fears about XRP. Most of these are related to Ripple's control of the XRP ecosystem, and concerned about future actions that Ripple could take which would hurt XRP investors. I do not plan to invest in XRP, but I can see why it has and will attract others. As a cryptocurrency, it offers great performance, with low fees, quick speeds, and great scale-ability according to Ripple. Bitcoin (COIN, OTCQX:GBTC) has always been the largest cryptocurrency. Satoshi Nakamoto invented cryptocurrency and developed the first popular cryptocurrency. 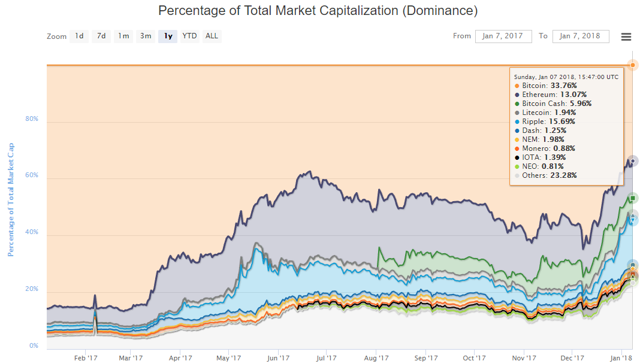 Until 2017, Bitcoin had maintained 80-95% market share of the cryptocurrency market, by market cap. That lead has weakened substantially, as I described in Bitcoin Is Weaker Than Ever But Ripple Is Not A Good Alternative. One of the biggest reasons for this weakening, with Ethereum, is the rise of Ripple's "XRP" tokens. XRP had a phenomenal year. During 2017, XRP gained an amazing 37,400% (CoinMarketCap). During the same time, XRP's market cap increased from $237 million to $89 billion. 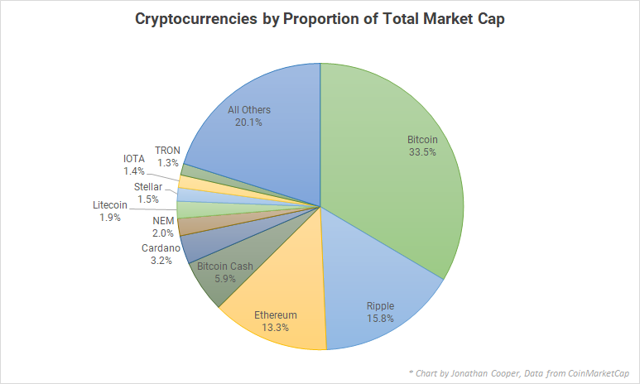 (There are a few different ways to calculate XRP's market cap, and other sources cite higher numbers, based on a larger base of available tokens.) XRP has gained value much more quickly than the wider cryptocurrency market. During the same year, Bitcoin gained "only" 1,270%, and Bitcoin's market cap increased 1,430%. Ripple is a company based in San Francisco with ~150 employees. Ripple's site notes they have offices in San Francisco, New York, London, Sydney, India, Singapore and Luxembourg, and they have more than 100 customers around the world. Ripple develops enterprise blockchain products which allow banks and payment providers to reduce their costs and to move money around the world. 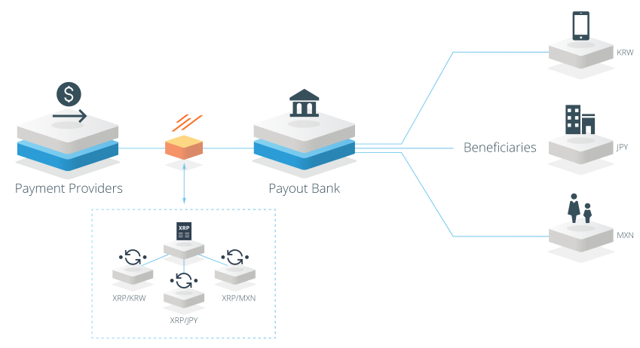 Ripple offers three primary products: xCurrent to process payments, xVia to send payments, and xRapid to provide source liquidity. From their website, xCurrent is the only released product of the three. Ripple has a helpful, well-made video on their site which explains how xCurrent works. These products sound useful, although I am unsure if they are innovative. But Ripple is not publicly-traded, so their usefulness is not relevant to me and I did not investigate xCurrent or xVia. xRapid is for payment providers and other financial institutions who want to minimize liquidity costs while improving their customer experience. Because payments into emerging markets often require pre-funded local currency accounts around the world, liquidity costs are high. xRapid dramatically lowers the capital requirements for liquidity. The use case Ripple is targeting is settling international payments, particularly in payment corridors that are not the very most popular. The idea is this: Someone wants to make a payment from Singapore to Thailand. To provide cleared funds immediately, we need to give the recipient ownership of funds that are already in Thailand, right where the recipient needs them. And, again to complete the payment immediately, we need someone to take ownership of the Singapore funds and provide the asset we use to buy the funds in Thailand. We could do this directly, but that would mean that the payment could only be facilitated by someone who both had funds in Thailand and was willing to accept funds in Singapore. That might not be all that many people, and they might charge a lot because the market is narrow. Enter XRP. You can have a robust market of people willing to pay XRP to get funds in Singapore. And you can have a robust market of people willing to provide funds in Thailand in exchange for XRP. Now, to make that payment, you trade on two efficient markets instead of one inefficient one. Why XRP? Because XRP transactions can be final in just a few seconds, XRP transactions have low cost, and Ripple has put a lot of effort into optimizing XRP for this exact use case. Most importantly, Ripple is tremendously dedicated to making XRP work for this use case, and has a war chest with a notional value in the billions that it can use to make it happen. As a cryptocurrency, XRP offers an average transaction time of 3.43 seconds, a transaction fee of ~0.2-2 cents, and can support 1,500+ transactions per second. Ripple is targeting smaller currency pairs (e.g., EUR->INR), where exchanges might be less efficient than larger pairs (e.g., EUR->USD). The idea is that banks and companies would hold XRP, as it would allow them to easily convert that XRP into any currency in any country for lower fees than are available on smaller currency pairs. The XRP itself would be able to move inexpensively around the world. A local market-maker for, e.g., INR, would be able to offer attractive rates for XRP->INR conversion. These rates could be much better than EUR->INR rates, due to the liquidity of XRP and because local market-makers need only hold two assets, XRP and INR, and not a variety of foreign currencies. Other cryptocurrencies could also be used for these tasks. There is nothing preventing market-makers from offering attractive exchange rates on ETH, BTC, BCH, LTC, or any other currency. Markets can and do exist for many cryptocurrency-to-currency pairs. Ripple may be better-equipped for this problem. Ripple has experience building systems for banking and may be able to build software with features banks need, and may be able to market well to banking customers. XRP also has more desirable transaction characteristics than many other cryptocurrencies: faster transactions, cheaper transactions, can support higher numbers of transactions. Is This Different Than Bitcoin? Yes, there are many differences between XRP and Bitcoin. Some of these differences may be relevant to traders, while other differences may not. XRP is owned and run by a corporation (Ripple), while Bitcoin is not. Bitcoin does not have a central authority figure in the same way that Ripple does. There are some Bitcoin authority figures: people with commit access to Bitcoin Core, leaders of major exchanges like Coinbase (COINB), leaders of major mining pools, and makers of mining devices. However, the protocol works through decentralized consensus, and each of these players can only succeed in changing Bitcoin with the agreement of others. In contrast, Ripple can alter XRP at will, since it is their invention and their network. In short, Bitcoin is decentralized in ways that XRP is not. XRP was pre-mined while all Bitcoins in existence were mined by miners doing proof of work problems. When Ripple created XRP, they created 100 billion XRP and owned all of them. Today, Ripple still owns 61% of XRP in existence. In contrast, Satoshi (if he is still alive) owns ~ 6% of all BTC, all of which were mined via proof of work, just as BTC are mined today. Bitcoin offers free wallets. Ripple wallets require a minimum deposit of 20 XRP, and the first 20 XRP is locked in your wallet. Effectively, this means that opening a wallet costs 20 XRP, or ~$68, depending on XRP prices. Of course, since XRP is centralized, Ripple could change this cost in the future. Why Do Some Cryptocurrency Enthusiasts Dislike Ripple? One fear about XRP is that it is a "scam." Many people would say the same about every cryptocurrency. If you fall into that category, you presumably also do not like XRP. 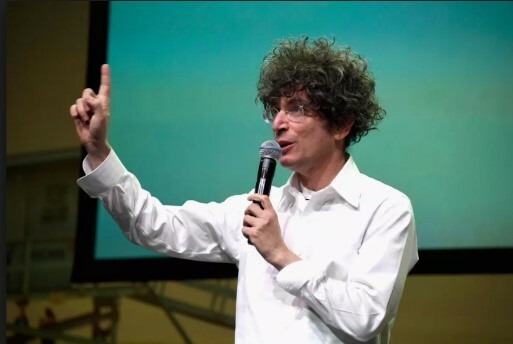 However, I am interested in cryptocurrency proponents who dislike XRP, with some even suggesting it is a "scam". These beliefs generally stem from differences between Ripple and many other cryptocurrencies, such as Bitcoin. I will let you judge for yourself. XRP was created by Ripple, with Ripple initially owning all 100 billion XRP. There is no mining of any sort. The software and network were created by Ripple, who then sold XRP for profit. Supply is hard-capped at 100 billion, and will decrease over time because transactions result in the permanent destruction of XRP. This is in stark contrast to other major coins like Ethereum and Bitcoin, which employ mining to expand and control supply. Ripple still controls the majority of XRP, especially when including insiders like former CEO Chris Larsen, who owns 5.2 billion XRP (~$17.5 billion USD). This introduces XRP-specific issues for the asset. Ripple's vast supply of XRP compared to the float could easily sink XRP prices. The company and its former insiders control at least 2x as much XRP as all traders, investors, and banks combined. If this supply was released onto the market, XRP's price would tank. The interest of XRP investors and Ripple are not necessarily aligned. Ripple's success does not depend on the value of XRP. Ripple has other products, such as xVia and xCurrent, and can creature further products. Ripple's success as a company does not depend upon XRP. Ripple currently owns a large amount of XRP, so they currently benefit from XRP's high price. However, if the system were to be deployed and used by banks, Ripple's stake in XRP supply would decrease. In a future "steady-state" scenario where Ripple is no longer actively selling XRP, Ripple's stake in XRP's price may be minimal. Nothing prevents Ripple or a competitor from releasing an improved "xRapid 2" based on a different digital asset. XRP holdings are tied to one solution for banks, and other solutions could be developed and take market share from XRP. xRapid does not currently see significant use by any banks. 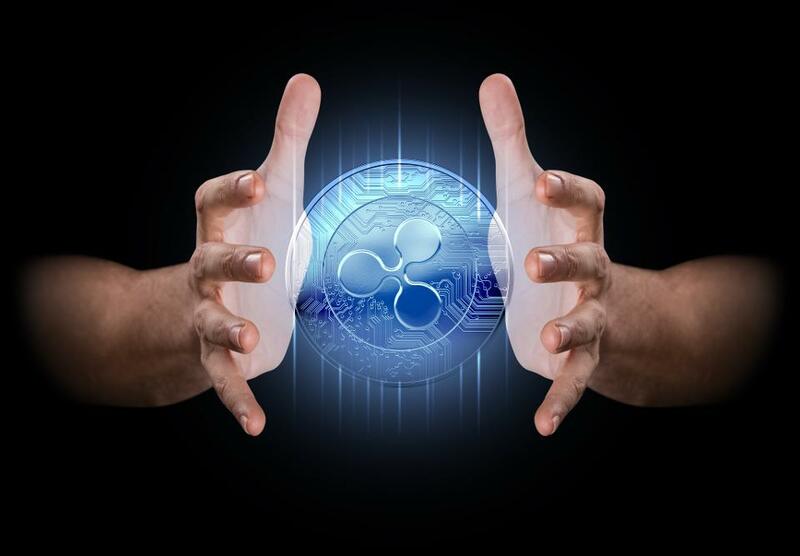 An investment in XRP is buying into a product that could in the future see use, although it could also be discarded by the company that created it in favor of a newer, improved technology. Its market share - currently about 0% - could also be usurped by competitors offering superior products or lower fees. Even if XRP sees use by banks, it is unclear benefits will flow to investors. Banks are likely to require large amounts of XRP (in dollar terms) to conduct the transactions that xRapid is designed to facilitate. If a bank needs to purchase millions or billions of dollars of XRP, where will they turn? Sure, they could log in to Kraken and purchase XRP on the open market. But they could also purchase or borrow the XRP from the 55% held by Ripple for this purpose. It is not clear that there will be a market for individual investors' relatively-small XRP holdings even if xRapid itself is adopted by banks and market makers. Critics of XRP also question why a wallet costs ~$68 (20 XRP). Other cryptocurrencies do not tie a specific amount of currency to a wallet, but instead allow users to sell their entire holding. Purchasing a wallet is not inherently a problem - 20 XRP was 13 cents a year ago - but the current price of XRP makes wallets very expensive. Because XRP is centralized, this price may be reduced in the future. For now, ~$68 is a high price for a wallet. Should I Invest In XRP? I do not plan to invest in XRP, despite having owned in BTC, BCH, ETH, LTC, and other cryptocurrencies. (I currently own BCH and ETH.) However, this means that I have missed out on 37,400% gains in 2017. I will also miss out on whatever gains or losses XRP makes in 2018. To me, XRP is an investment in a speculative product from a corporation (xRapid) which shows tremendous product. That product has not yet been widely adopted for its designed purpose. Unlike equity ownership in stocks, it is not clear that the success of xRapid will necessarily flow through to XRP owners. I do not necessarily expect xRapid to fail, but I don't think it has shown enough success to justify an ~$130 billion market cap. XRP is speculative, and its investors may continue to show tremendous gains, but I will be sitting on the sidelines. Other investors should weigh the benefits of XRP and the xRapid system with the potential risks caused by the centralized control and ownership of the system. These issues are unique to XRP when compared to ETH, BTC, and other cryptocurrencies. XRP also suffers from many of the same risks as other cryptocurrencies. XRP could be replaced by other bank payment systems, just as Bitcoin could be replaced by Ethereum or Tron. XRP could also never be adopted by banks, just as Ethereum's smart contracts may not find users. Investors should weigh these risks when considering opening an XRP wallet and purchasing XRP. XRP's characteristics may be attractive to traders. Transactions are fast and inexpensive compared to other coins. Prices fluctuate wildly. I am not a trader, but these are positive characteristics for those hoping to profit from liquidity and volatility. I will leave XRP trading to those with more skill, courage, and experience.